The Virginia-Pennsylvania frontier was a place of countless dangers for European settlers. Numerous Native American tribes, in particular the Shawnee, Mingo, Wyandot and Lenape/Delaware lived throughout the upper Ohio Valley. During this period Native American attacks on settlers were common throughout region; and ultimately, lead to the decision to build Pricketts Fort. The fort itself was never directly attacked, and written documentation of any interactions between people living on the grounds of the fort and Native Americans is sparse. 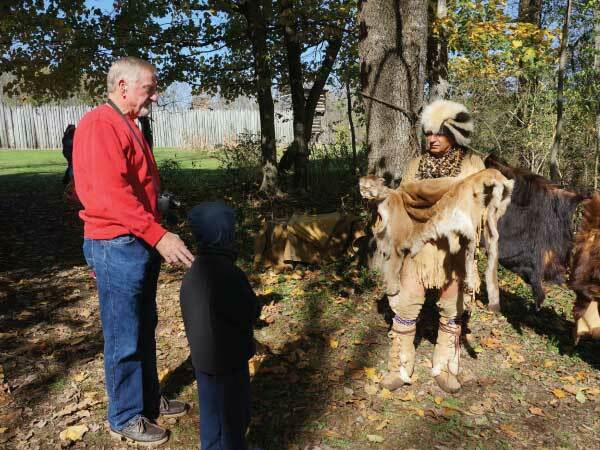 Testimonies from the earliest traders and settlers in the region make clear that there were small Native American settlements scattered throughout the region in the first half of the 18th century. It is well known that there were extensive trade relationships between the Native Americans of the Ohio River Valley and the European frontier settlers during both the 18th and 19th centuries. During this time the Ohio River Valley was alive with interactions between Woodland Indians and European settlers. Many treaties were made and wars were fought. Often, land ownership was at the root of these confrontations. Documented evidence suggests that some of the primary Native American inhabitants of the middle Ohio River Valley spoke two general languages: Macro-Siouan and Macro-Algonquian. These tribes can be traced as the ancestors of modern day Shawnee, Delaware, and Iroquois peoples.